TLJ Daily E-Mail Alert No. 772, November 5, 2003. November 5, 2003, 9:00 AM ET, Alert No. 772. 11/4. The Federal Communications Commission (FCC) adopted and released a Report and Order Further Notice of Proposed Rulemaking [72 pages in PDF] in its proceeding titled "In the Matter of Digital Broadcast Content Protection". This item promulgates rules that include a broadcast flag mandate. The FCC's interest in copyright protection is promoting a transition to DTV. 11/4. The U.S. Court of Appeals (9thCir) issued its split opinion [PDF] in James Newton v. Beastie Boys, a copyright infringement case. Background. James Newton is an accomplished jazz flutist. In 1978 he composed a song titled "Choir," a piece for flute and voice intended to incorporate elements of African-American gospel music, Japanese ceremonial court music, traditional African music, and classical music, among others. He is also a professor in the music department at California State University at Los Angeles, and a former Guggenheim fellow. The Beastie Boys engage in the practice of sampling, or, the incorporation of short segments of other musical recordings into their own recordings. They used a six second sample from Newton's "Choir" in their song, "Pass the Mic". The lyrics are unremarkable. This song looped, or repeated, the sample forty times. The Beastie Boys obtained license to use the sound recording, but not the underlying composition. ECM Records holds all rights in the sound recording. Newton retained all rights in the composition. Both are protected by copyright. District Court. Newton filed a complaint in the U.S. District Court (CDCal) against each of the Beastie Boys and various other involved entities alleging infringement of his copyright in the music composition, as well as Lanham Act violations for misappropriation and reverse passing off. The District Court dismissed the Lanham Act claims, and granted summary judgment to the Beastie Boys on the grounds that the short sample lacked sufficient originality to merit copyright protection, and because the copying was de minimis. Newton appealed. Court of Appeals. The Court of Appeals affirmed in a split opinion. It held that the sample is original, and qualifies for copyright protection, but that it constitutes de mininis copying. Both the majority and dissent concluded that sampling is de minimis only if an average audience would not recognize the appropriation. They differed as to whether there was a question of fact to be submitted to the jury on this issue. Judge Mary Schroeder wrote the opinion of the Court. Judge David Thompson joined. Judge Susan Graber dissented. This case is not about the moral rights of authors, for the simple reason that, except in the case of certain visual art works, the Copyright Act does not implement the moral rights provisions of the Berne Convention. Article 6bis of the Berne Convention provides that "Independently of the author's economic rights, and even after the transfer of the said rights, the author shall have the right to claim authorship of the work and to object to any distortion, mutilation or other modification of, or other derogatory action in relation to, the said work, which would be prejudicial to his honor or reputation." Perhaps composers who find themselves in Newton's position have a claim that sounds in the nature of a violation of their moral rights not to have their works distorted or mutilated. But, this right does not exist in the U.S., so composers are left to protect the integrity of their work with copyright infringement and Lanham Act remedies that are designed to address economic harms. This case is James Newton v. Michael Diamond, Adam Horowitz, Adam Yauch, dba Beastie Boys, Capitol Records, et al., U.S. Court of Appeals for the 9th Circuit, No. 02-55983, an appeal from the U.S. District Court for the Central District of California, D.C. No. CV-00-04909-NM, Judge Nora Manella presiding. 11/4. The Senate Judiciary Committee's Subcommittee on Terrorism, Technology and Homeland Security held a hearing titled "Database Security: Finding Out When Your Information Has Been Compromised". Sen. Patrick Leahy (D-VT), the ranking Democrat on the full Committee, wrote in his opening statement that "As technology has advanced, and particularly since the terrorist attacks of September 11th, there has been a surge in government and private sector efforts to create large databases that compile extensive personal information, often through so-called data-mining. The Bush Administration has done this in the name of homeland security, and private companies have argued that gathering this information is essential to their commercial ventures." He continued that "Administration projects like the Total Information Awareness initiative threatened to violate privacy and other civil liberties and provoked an overwhelming outcry from the public. Just recently we learned that a DOD contractor, Torch Concepts, obtained an airline passenger database without those passengers’ knowledge, used it in ways not admitted to the airline, and publicly released the personal information of one of those unsuspecting passengers." He concluded that "I am particularly concerned that criminals view these databases as virtual goldmines for illegal activities, most notably identity theft." 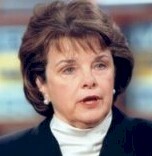 Sen. Dianne Feinstein (D-CA) discussed S 1350, the "Notification of Risk to Personal Data Act", which she introduced on June 26, 2003. It would require government agencies, commercial entities or individuals that own or license electronic databases containing personal information to notify individuals whose information is stored in those databases when the security of the database is breached. See also, story titled "Sen. Feinstein Introduces Bill to Require Disclosure of Unauthorized Access to Electronic Data" in TLJ Daily E-Mail Alert No. 691, July 1, 2003. Sen. Feinstein (at right) wrote in her opening statement that "Unfortunately, data breaches are becoming all too common and current law does not require notification to consumers when these breaches occur." She said that "If individuals are informed of the theft of their Social Security numbers or other sensitive information, they can take immediate preventative action. They can place a fraud alert on their credit report to prevent crooks from obtaining credit cards in their name; They can monitor their credit reports to see if unauthorized activity has occurred; They can cancel any affected financial or consumer or utility accounts; They can change their phone numbers if necessary; Prompt notification will also help combat the growing scourge of identity theft." David McIntyre P/CEO of TriWest Healthcare Alliance, a health care company, wrote in his testimony about a burglary of a TriWest office that resulted in the theft of computer equipment and files containing personal information of 500,000 people, including names, addresses and social security numbers. He said that it is important to notify customers promptly after a breach. He stated that "Health care professionals talk about the ``Golden Hour´´ when they refer to the window in which it is critical that heart attack victims receive medical attention if they are to have high odds for survival and a reasonable quality of life. What I quickly discovered is that there is a ``Golden Hour´´ when it comes to aiding consumers in protecting themselves against identity theft as well. The experts told me that if it we wanted the best chance of protecting our customers from identity theft, we had no more than a couple of weeks to reach our customers and assist them in contacting the credit bureaus so they could act to place fraud flags on the credit files." Evan Hendricks, the Editor of Privacy Times, identified several threats to data security and privacy in his prepared testimony. He wrote that "identity theft continues as one of the fastest growing crimes". Second, he said that "there is a community of hackers constantly probing and testing data security. We still do not know the percentage of hackers that are hacking for malicious purposes. However, we do know that there is a community of ``Carders,´´ that is, hackers who specialize in obtaining and trafficking in credit card numbers." Third, he said that "there is not a strong organizational culture of data security throughout many organizations, even though they maintain or have access to the personal data of millions of Americans. This is due in part to the relative ``newness´´ of the electronic data age, but in my opinion, more attributable to the absence of long-standing and well-known law and policy that would require organizations to take seriously the issues of data security and privacy." Finally, he said that "Another concern is the trend towards outsourcing data processing chores to overseas firms in lower-wage countries, including The Philippines, India, Pakistan and Jamaica." He wrote that S 1350 is a good starting point, but that legislation should also include a private right of access to data, include a private right of action, and curtail the use of social security numbers as personal identifiers. Mark MacCarthy, an SVP at Visa USA, also testified. He wrote in his prepared testimony that it is "a top priority" at Visa to "protect consumers from the effects of information security breaches". 2:00 PM. The Senate Governmental Affairs Committee will hold a hearing to examine the report of the Presidential Commission on the U.S. Postal Service. On July 31, 2003, the President's Commission on the United States Postal Service issued a report [208 pages in PDF] titled "Embracing the Future, Making the Tough Choices to Preserve Universal Mail Service". See, story titled "Presidential Commission Reports on USPS and E-Mail" in TLJ Daily E-Mail Alert No. 710, August 4, 2003. Location: Room 342, Dirksen Building. 9:30 AM. The Senate Judiciary Committee will hold an executive business meeting. The agenda includes consideration of several judicial nominees, and consideration of James Comey to be Deputy Attorney General. See, notice. Press contact: Margarita Tapia (Hatch) at 202 224-5225 or David Carle (Leahy) at 202 224-4242. Location: Room 226, Dirksen Building. 10:00 AM. Two of the House Government Reform Committee's subcommittees will hold a joint hearing titled "Public Safety Interoperability". The witnesses will include William Jenkins (Director of the GAO's Homeland Security and Justice Issues), Marilyn Ward (Chairman, National Public Safety Telecommunications Council), Aldona Valicenti (National Association of State Chief Information Officers), Marilyn Praisner (Councilwoman, Montgomery County, MD), George Ake (Capital Wireless Integrated Network), Karen Evans (E-Gov/IT Director at OMB), David Boyd (Department of Homeland Security), John Muleta (Chief of the FCC's Wireless Bureau), and Edmond Thomas (Chief of the FCC's Office of Engineering and Technology). Location: Room 2154 Rayburn Building. 11/4. The Federal Communications Commission (FCC) released a Report and Order [99 pages in PDF] that amends Parts 2, 25 and 87 of the FCC's rules to implement various decisions made at World Radiocommunication Conferences (WRC). The report and order contains this introductory summary: "By this action, we amend Parts 2, 25, and 87 of our Rules to implement domestically various allocation decisions from several World Radiocommunication Conferences ("WRCs") concerning the frequency bands between 28 MHz and 36 GHz, and to otherwise update our Rules in this frequency range. The following actions are the most significant to non-Federal Government operations: (1) implementation of generic mobile-satellite service ("MSS") allocations in the bands 1525-1559 MHz and 1626.5-1660.5 MHz ("L-band"); (2) allocation of the band 1164-1215 MHz to the radionavigation-satellite service ("RNSS"); (3) deletion of unused and limited fixed-satellite service ("FSS") and broadcasting-satellite service ("BSS") allocations from the band 2500-2690 MHz; and (4) upgrade of the Earth exploration-satellite service ("EESS") allocation in the band 25.5-27 GHz from secondary to primary. In addition, at the request of the National Telecommunications and Information Administration ("NTIA"), we implement various allocation changes for the space science services and the inter-satellite service ("ISS"), most of which involve spectrum primarily used by the Federal Government. These actions conform our Rules to previous WRC decisions and are expected to provide significant benefits to the American public." The report and order addresses secondary mobile satellite service (MSS) use of the 14-14.5 GHz band. It states, at Paragraph 72, that "The band 14-14.5 GHz is allocated for FSS uplinks on a primary basis for non-Federal Government use. This band is heavily used by Very Small Aperture Terminals ("VSATs") for uplinking to geostationary satellites.138 These VSAT systems provide video and data communications and are widely deployed at business locations, ranging from the largest corporate headquarters to the smallest convenience stores." It concludes, at Paragraph 76, that "We are allocating the band 14-14.5 GHz to the MSS, including AMSS (Earth-to-space), for non-Federal Government use on a secondary basis ..." It continues that "we believe that such use of the band appears to be technically feasible and would be helpful in meeting the growing demand for two-way broadband data and communications capabilities for commercial aircraft passengers and crew. Further, WRC-03 added a worldwide secondary AMSS allocation in this band. We find that conforming the US Table to this recent international allocation is desirable because it will facilitate an important new use of the 14-14.5 GHz band on a non-interference basis to other uses of the band." This proceeding is titled "In the Matter of Amendment of Parts 2, 25, and 87 of the Commission's Rules to Implement Decisions from World Radiocommunication Conferences Concerning Frequency Bands Between 28 MHz and 36 GHz and to Otherwise Update the Rules in this Frequency Range Amendment of Parts 2 and 25 of the Commission's Rules to Allocate Spectrum For Government and Non-Government Use in the Radionavigation-Satellite Service". It is ET Docket No. 02-305. This report and order is FCC 03-269 in RM-10331. This report and order was adopted on October 31, and released on November 4. 11/4. Pascal Lamy, Trade Commissioner of the European Commission, gave a speech titled "Trade Crisis?" at the European Institute in Washington DC. He addressed the Cancun ministerial, China, bilateral agreements, and U.S. EU trade disputes, such as FSC, beef and bananas, genetically modified foods, and steel. One of the topics that he addressed in detail was the United States' Foreign Sales Corporation (FSC) and Extraterritorial Income (ETI) tax regimes, that the World Trade Organization (WTO) has held to constitute illegal export subsidies. The EU, which is entitled to impose retaliatory tariffs, has threatened tariffs on U.S. technology exports. The Congress is currently working on repeal and replacement legislation. Lamy (at right) stated, "So the common denominator between the FSC and steel case -- or indeed their link with the bananas and hormone cases -- is not whether or not the EU is going to retaliate or not, which areas our retaliation will hit, when we are going to do it, and so on. The question to answer, as the US put it in the hormone and bananas cases back in 1999, or on GMOs, where the US has launched a case this autumn, is: when is the other side going to bring itself into conformity with the rules? On steel, when is the US going to lift the tariffs it imposed back in the spring of 2002? On FSC, when is the US going to pass the repeal legislation, which we have been eagerly awaiting for three years now, to end the illegal export subsidies which have been around for years and years. And you will understand that this has been my primary focus in discussions over the last couple of days." He also stated that "For those who remain interested in the simpler question (whether or not we will retaliate), the answer is yes, if the US does not move to comply within the clearly recognised deadlines. Consider FSC, where we have been waiting for compliance since November 2000 when the WTO Appellate Body found against the FSC for compliance. We have said that retaliation will begin in the early part of next year if FSC is not repealed before the end of the year." 10/31. The U.S. District Court (DC) issued a Scheduling and Case Management Order [9 pages in PDF] in USA v. First Data & Concord EFS, Inc., D.C. No. 03-2169 (RMC). Trial will begin on December 15, and continue for seven business days. See also, story titled "DOJ Sues to Stop Merger of PIN Debit Networks", also published in TLJ Daily E-Mail Alert No. 765, October 24, 2003. 10/31. The Office of the U.S. Trade Representative (USTR) published a notice in the Federal Register requesting comments regarding barriers to U.S. exports of goods, services and overseas direct investment for inclusion in the USTR's annual National Trade Estimate Report on Foreign Trade Barriers (NTE). The USTR seeks comments on, among other issues, lack of intellectual property protection, trade restrictions affecting electronic commerce, restrictions on the use of data processing, technology transfer requirements, limitations on foreign equity participation, and anticompetitive practices. See, notice in the Federal Register, October 31, 2003, Vol. 68, No. 211, at Pages 62159 - 62160. Comments are due by December 12, 2003. 11/4. The Federal Communications Commission (FCC) held an event titled "Rural Wireless Internet Service Provider (WISP) Showcase and Workshop". See, remarks [PDF] by FCC Chairman Michael Powell, and agenda [PDF]. 11/4. The Federal Communications Commission (FCC) issued several documents intended to provide information to consumers about wireless local number portability (WLNP). The FCC has adopted rules that require wireless carriers to make WLNP available to consumers in the top 100 Metropolitan Statistical Areas (MSA) starting November 24, 2003. In other areas, wireless carriers must make WLNP available by May 24, 2004, or within six months of a wireless carrier's receiving a porting request from another carrier, whichever is later. See, FCC release [PDF], document [3 pages in PDF] titled "Wireless Local Number Portability: FCC Consumer Facts", Availability List [PDF], and Availability Map [PDF]. 11/4. The Federal Communications Commission (FCC) released a report [50 pages in PDF] titled "Telephone Subscribership in the United States (Data Through March 2003)". It addresses telephone subscribership levels in the United States, and provides tables and charts with breakdowns by state, race, age, employment status, and income. The report estimates that 95.5% of all households in the United States have telephone service. See also, FCC release [PDF]. It was written by Alexander Belinfante of the Industry Analysis and Technology Division of the Wireline Competition Bureau. 11/4. The U.S. Patent and Trademark Office (USPTO) announced that the Trademark Trial and Appeal Board (TTAB) "has expanded the options for electronically filing documents in trademark disputes. Using the Electronic System for Trademark Trials and Appeals (ESTTA) system, parties to a dispute now can file more documents electronically with the TTAB, including requests for extension of time to oppose and notices of opposition. Parties also can use ESTTA to file motions and other documents in inter-partes cases." See, USPTO release.